As we all know, to be successful in commerce we have to make it easy for the customer to make business with us. That’s why it is not just about the classic web shop anymore, it is of course about mobile, but also about all the other nice and innovative touch points like Microsoft HoloLens, the self-ordering smart shelf or voice assistants. 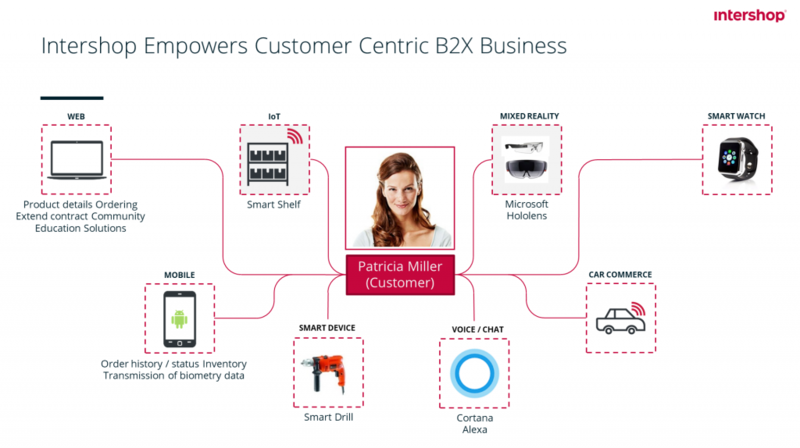 From the customer’s point of view this is easy: Provide a frictionless and personalized digital purchasing and services experience, wherever and whenever it is requested or initiated by a customer or device. From the architecture point of view, this has a dramatic impact. It is not sufficient anymore that the server renders web pages and transfers them to the web browser. Instead, every functionality must be exposed as API so that it can be consumed by any touch point. This approach is often called headless because the front end (or the “head”) is decoupled and in some cases completely removed. 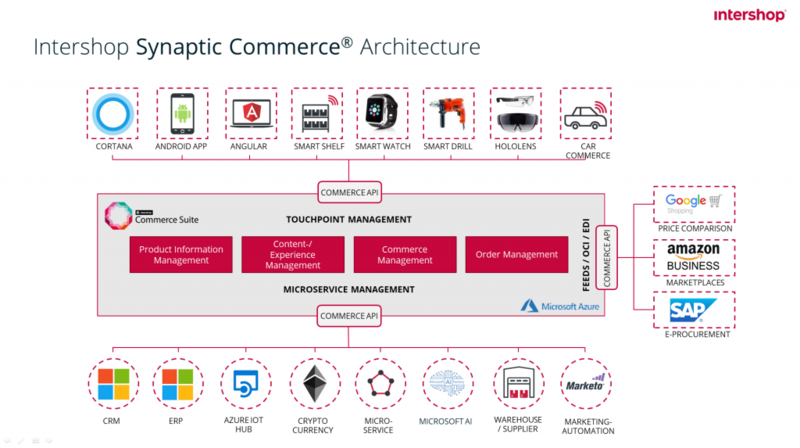 For Intershop I prefer the term API-based commerce platform with a decoupled front end because Intershop does not just provide the APIs, but also a progressive web app based on Angular. Note the trigger action “BuyPrinterPaper” at the end of the code example. That is where AI comes into play with Microsoft LUIS natural language. 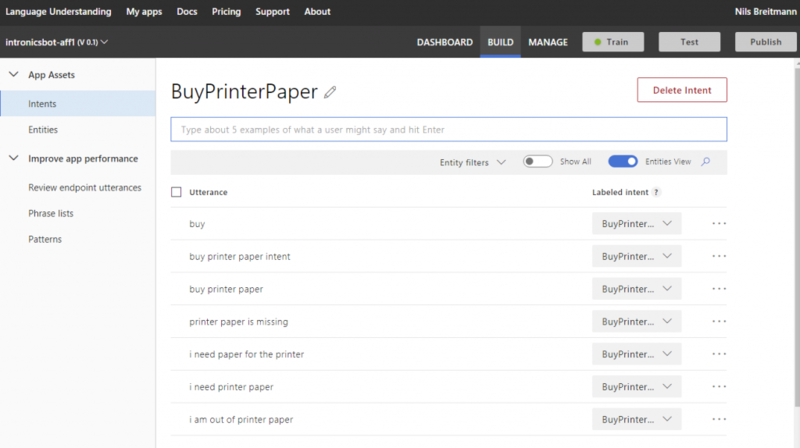 In the LUIS portal, I defined the “intent” that printer paper is needed. That means, in my bot code I do not have to check for a hard-coded set of phrases, instead I can rely on LUIS to understand the intent of the customer, even if different words and phrases are used. Now let’s put the code into action. By default you get a Web Chat channel with your Chat Bot, ideal to test the bot. 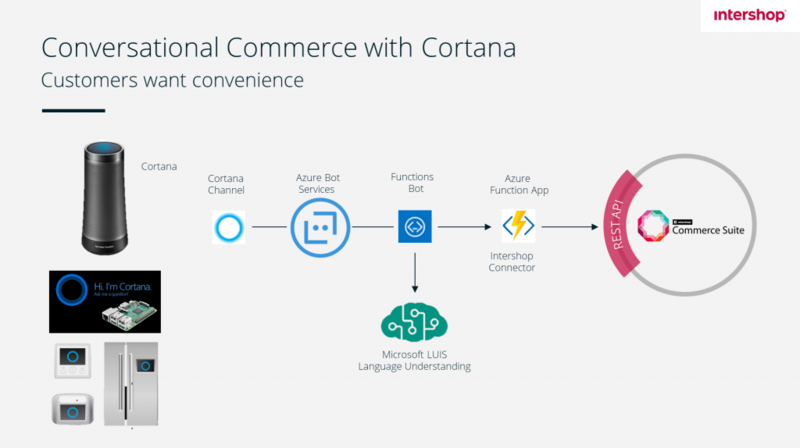 However, we want voice commerce so I also added a Cortana channel to actually realize a conversation. The Cortana channel is connected to your Microsoft account and the Cortana skill for the Bot is automatically added to your Cortana. It can also be shared with a group of test users.